So three Europa League games, three draws for British sides. We'll see you at the weekend. We go into the the game against Everton and we will focus on our performance. The players will look forward to it. I haven’t lost a derby yet and they are always good games. We are point behind Everton - I know the media and written press will build the game up but we will stay calm. I am immensely enjoying the job, it is a great challenge and it is a rebuilding job again. This is where we find out about players like Divock Origi and others on the fringe. They will be important for us in games like these. Divock did well but he didn’t score and he has to add that to his game. The result was disappointing considering the number of chances we created. We worked well and had a good start but gave away a disappointing goal. The players worked hard but we couldn’t score the goals. You have to be clinical. We scored a good first goal. They weren’t half chances, they were good chances and you have to score them at this level. We have to win a game like that. "You've got to be better at the back. Efe Ambrose keeps making these mistakes. You keep asking when it's going to stop, IF it's going to stop. I can't understand why you don't mark their tallest player (at corners). Somebody will need to sit me down in a dark room and explain that one to me." Follow reaction from Celtic Park here. Bournemouth, West Ham , Carlisle and now Sion have all out played Liverpool at Anfield, this is pathetic. Rodgers has to go sooner rather than later. "There was a lot of positives we'll take from the game" "final third let us down"
Liverpool have had 29 shots on goal in their two Europa League games to date. Liverpool midfielder Adam Lallana: "We need to win our home games in this competition. We had enough chances tonight - listen, we wanted three points and we felt we created enough. "No excuses, I should have had a second. Divock Origi had a few good opportunities. "I'm sure the fans are frustrated. We have a massive game on Sunday. The derby has spice in it and hopefully we can get three points." How are Liverpool fans feeling about Sunday's derby now then? Of course, of the players who featured tonight maybe only three or four will feature - if that many. You can follow reaction and fallout from Celtic Park here. Next up for Liverpool, of course, is the Merseyside derby on Sunday. Our expert Mark Lawrenson has this one down as a 1-1 draw, but what do you think the score will be? Predict the result of that match and the rest of the weekend's fixtures in our Premier League Predictor game. And that's the game! Plenty of boos and jeers at Anfield greet the final whistle. THREE MINUTES added on. Get it to Steven G.... ah. Philippe Coutinho is on a higher plane than his team-mates and opponents tonight. He glides past two or three men on the left wing, the pitch opens up and he goes to curl a shot into the far corner but he's well charged down. Sat in the labour ward at Arrowe park hospital waiting for my Missus' waters to break. Not sure what is more boring - following LFC or waiting for this baby to come along! Sion goalscorer Ebenezer Assifuah comes off after taking a whack a few minutes ago. A memorable night for him. Will it be enough to earn a point though? Seven minutes left. Any more for any more? Becky: It's the lack of atmosphere at Anfield that worries me. Philippe Coutinho whips in a free-kick - Emre Can heads wide. Surely a second goal is coming? Kolo Toure has lasted 75 minutes but he can't do the 90. Goosed. Off he comes, on comes Mamadou Sakho, who takes the armband too. Liverpool have looked sharp in the last 20 minutes, can they finish it off now? Got to score! No! It's a brilliant touch from Adam Lallana to take a cross from the left and spin in one movement, he's only 10 yards out but he can't put it past Andris Vanins. Again. SMS Message: Credit to you Tom, trying hard to make this game seem interesting. But can you arrange an internet based Mexican wave? from Si, Wirral. Credit to you Tom, trying hard to make this game seem interesting. But can you arrange an internet based Mexican wave? Philippe Coutinho hits a free-kick which is well saved again by Andris Vanins. 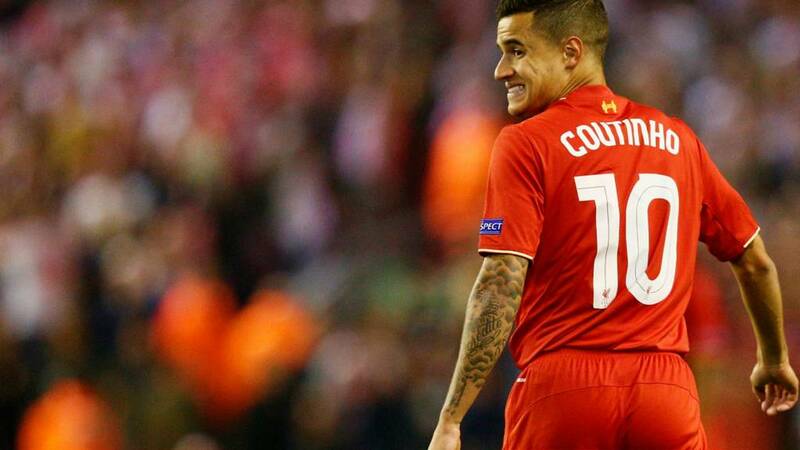 Everton will be pleased to see Coutinho out there tonight. An extra half-hour in the legs ahead of Sunday's derby. It's really opening up now! Philippe Coutinho has added a real edge to the game, a class act, and his pass is lovely. Divock Origi is in on goal, he has to stretch and Andris Vanins spreads himself well to make the stop. Good chance now for the visitors as goalscorer Ebenezer Assifuah spins Joe Gomez inside the box and fires in left-footed, but Simon Mignolet saves sharply. More goals in this game I reckon. Just over 20 minutes left. Great ball from Joe Allen sends Divock Origi in on goal. Haring away, he does really well to sell the last man a dummy, he slides past and then Origi drills a shot into the legs of keeper Andris Vanins. Liverpool do summon Philippe Coutinho from the bench with a full half-hour remaining. He replaces England's Danny Ings. Chris Lee: Sitting here on sun lounger in St Lucia, another promising Liverpool start descends into mediocrity! Where is the quality? Back to work - and back to enjoying yourself you two! The Europa League is not that important is it? Shades of the young Emile from Divock Origi as he picks the ball up on the left, turns his defender and then sprints 30 yards into space. Excellent surge, but his low cross/shot is well turned away by Leo Lacroix. A nice ripple of applause as Philippe Coutinho trots down the sideline to warm up for Liverpool. With the Merseyside derby just days away, Brendan Rodgers won't want to use his number 10 if he can help it. Carlitos has a dig from 25 yards, good strike on the free-kick but it's not in the corner far enough to trouble Simon Mignolet in the Liverpool goal. I can think of an iconic striker in every successful Liverpool team..Rush, Kenny, Fowler, Owen, Torres, Suarez to name a few. Can't put together all of the present team to match one of the above names. Sitting on my sofa in Worthing eating three-day old prawn crackers following tonight's football with you. Kolo Toure tries an overhead effort which is very high - but drops down on to the top of the crossbar! Danny Ings does well, taking the ball down nicely with his left foot and then having a shot well saved at the near post! The Kop appreciate that. And we are back up and running at Anfield. Half-time change for the Reds as Alberto Moreno replaces Nathaniel Clyne. That sees Jordon Ibe swap wings. SMS Message: I'm not at a lake, or in a hot tub. But I can't work out if it's Rodgers, the owners or the team. Or all of them. Sion showing much more desire and passion to win. I miss the days when we showed relentless passion! from Damon, Kentish Town. I'm not at a lake, or in a hot tub. But I can't work out if it's Rodgers, the owners or the team. Or all of them. Sion showing much more desire and passion to win. I miss the days when we showed relentless passion! Following the game during the interval of a play. Seems like goals aside it's a decent performance. "I don't feel sorry for Ronny Deila. He knows Efe Ambrose makes at least one mistake a game. We all said he would give up a chance. They have given Fenerbahce a chink of light when they were lost." Follow the Celtic game here. Tournament favourites Borussia Dortmund - unbeaten in seven Bundesliga matches this season under new manager Thomas Tuchel - are surprisingly behind in Greece against PAOK Salonika, home of Dimitar Berbatov. The Bulgarian is in the side, but it was team-mate Robert Mak who did the damage to give the hosts a 1-0 half-time lead. As for the PAOK fans - they are loving the Europa League. No apathy there. None at all. Any tweets from Sefton or Bootle?! Ryan Lloyd: Sitting here in Sao Paulo, Brazil, wondering what happened to Joe Allen during his injury layoff. What are Liverpool's owners actually watching? Please tell me they don't like this? STOP TINKERING WITH THE TEAM!!!! Best piece of play from Liverpool for a good half hour. Danny Ings and Adam Lallana combine to send Divock Origi into the penalty area. He should take the shot early on his left foot but he instead takes a touch and his shot is deflected away. At the other end Moussa Konate lifts a shot into the Kop. Chuckle Brothers stuff at the back from Celtic as a bungled header allows Fernandao to stab home. Get rid! Read all about that game here. Joe Allen is chopped down in midfield, Jordan Rossiter whips in the free-kick and Emre Can is free for the header - he just can't quite generate enough power to test Andirs Vanins in goal. Possibly the most classy start to a tweet we have ever had there Simon. We hope Liverpool don't spoil your fondue. Sion are keeping the ball easily in midfield. Simon Charbonnet: Sitting in a bistro in Sion, with LFC shirt on. LFC poor. My friends from Sion are loving this. Allen and Can...Overated! Just before that second Celtic goal Liverpool had a chance of their own. Adam Lallana - looking good tonight - helps in a cross from the left and Danny Ings can't gather it in on the bounce. A good touch and he would score. What a start for Celtic! Kris Commons blasts home Celtic's second after great work from James Forrest. Daniel Sturridge watches on from an executive box as Anfield goes very quiet. Shades of Carlisle last week? Celtic have the lead! Fenerbahce make a mess of clearing a corner and Leigh Griffiths hammers in from close range. Follow that game in full detail here. In the first 15 minutes it looked like Liverpool would walk this. Now, I'm not so sure. Struggling to get on the ball right now. Louis, you've invented a whole new level of criticism there. Is Kolo Toure just too experienced? He's thinking about Leeds away, 2003-04. How are you expected to perform in Europe if your back four consists of Toure, Can, Clyne and Gomez? A mix of not enough and too much experience. Liverpool respond in style. Adam Lallana crafts the move down the right, Nathaniel Clyne bursts in on the underlap and picks out Danny Ings for a tap-in from six yards out. Ings had just strayed offside though. Good call. His friends call him 'Ezeer and he is the main geezer! Ebenezer Assifuah stabs home at the Kop end after a lovely ball over the top from Xavier Kouassi. Liverpool's defending was a mess but the Sion players quite rightly celebrate in style. A second Liverpool goal is on the cards. Joe Allen plays a one-two, gets into the area and then delays before finding Danny Ings. Allen should have had a shot - and Ings is crowded out. Bright start from Divock Origi. He laid on the opener and now another very powerful burst down the right sees a low shot deflected across goal. Jordon Ibe collects on the left and should cross - but his shot is instead saved by Andris Vanins. Liverpool looking very comfortable, with young defender Joe Gomez seeing a lot of the ball on the left of their back three. Can they kick on and put the game to bed though? No further shots on goal since that Adam Lallana opener. A lively start in Glasgow, where the Fener fans are in full voice, but there have been no goals in the opening quarter of an hour. Noel Arthur: England is lucky to have Lallana...he's got that Spanish style of football in him. Liverpool face Everton at Goodison Park at the weekend so priority one tonight must be not picking up any injuries. That's if any of tonight's starting XI are in contention to play, of course. Adam Lallana has done his claims no harm with that early finish. Adam Lallana was possibly just offside in the build-up to that early opener but he got away with one there. Anfield in good voice now. Adam Lallanalikes the Europa League! He scored in Bordeaux and has an early goal at Anfield too. Good play from Divock Origi to drive into the box, hold off his man and then pick out Lallana in the middle. Lallana just steers it into the net. Great start! Just to wrap up things in Group J, FK Qarabag held on to beat Anderlecht 1-0, so they move up to second in the table. Spurs are top a point clear of the Azerbaijan side. The Swiss side get us under way - they are attacking the Kop in the first half. Anfield prides itself on its atmosphere but coming on the back of the Monaco game it sounds even better. It's an opportunity for them. The home games are very important so the onus is on us to take the game to Sion and get a win. We have a lot of young players in there but I trust the squad. You get my vote Bob. Let's have a straight knockout of 32 teams, no seeds. Could start it in February and wrap it up in May. Job done. It's the long drawn out format of the competition that makes it so arduous & unappealing. Getting rid of group stages & scrapping the ludicrous Champions League drop out rule would be good starting points. If you missed the earlier news, Liverpool striker Danny Ings has been included in the England squad for next week's Euro 2016 qualifiers against Estonia and Lithuania. Brendan Rodgers - and Liverpool fans - will probably be pleased to know, however, that Daniel Sturridge has not been included. Next up for Tottenham is a trip to Swansea in the Premier League on Sunday. Our expert Mark Lawrenson has this one down as a 1-1 draw, but what do you think the score will be? Predict the result of that match and the rest of the weekend's fixtures in our Premier League Predictor game. There's some weird and wonderful tales to tell in the Europa League... but how much do you know about the competition? BBC Sport's Marc Higginson has put together a little quiz to get the grey matter ticking over. Good luck! Try here. For reference, anything above 5 is a good score in my book. Tough one. Spurs bring on Tom Carroll for the last few minutes, he replaces Christian Eriksen for his 100th senior game. There are FOUR MINUTES added on. Monaco have been the strongest side in the last 20 minutes, Tottenham look tired. Harry Kane scored his first goal of the season at the weekend but he still hasn't got that sharpness he had last season. He takes a good touch to control a rare pass into him but can't get away from his defender. Great defending from Danny Rose, I love that. The home side fancy a late winner now as Nabil Dirar fires in a shot from 25 yards, it swerves but again Hugo Lloris can only spill it out. Danny Rose does well to react quickly and hook it out. Absolutely fabulous delivery, inch-perfect onto the head of Stephan El Shaarawy. It was only five yards out so no blame can be apportioned to Hugo Lloris. We used to care about the Uefa Cup. European teams still do. There used to be some exciting games. Apart from the name what changed? Is it the format? It's all about the cross! Two Monaco replacements combine as a quite brilliant ball in from Nabil Dirar is headed on goal by Stephan El Shaarawy - straight at Hugo lloris. The usually reliable Fenchman is slow to react and can only shin the ball into the net. Should save it. A half-hearted penalty appeal for Monaco as Danny Rose makes a challenge just inside the area - nothing doing. Harry Kane then sends Clinton Njie away on goal but the offside flag is up. Question: Is the carrot of earning a place in the Champions League by winning the Europa League enough to actually play in it? We have two teams with more than half an eye on weekend league fixtures playing a dull game in front of an empty stadium, at a strange kick-off time. It's not great. Andros Townsend has made a real difference, which is no surprise as this is a lot like an England friendly. He next beats a man and then finds Harry Kane, but his header is very lame and straight at Danijel Subasic. Spurs make another change as Andros Townsend comes on for Nacer Chadli. He is straight into the action - of sorts - as he finds Harry Kane to shoot over the top. The teams are out on the pitch warming up at Celtic Park - and our man Keir Murray is going through his own last-minute pre-match rituals. He's starting a dedicated live text commentary on that game any minute now. You can follow that here. Celtic: Gordon, Lustig, Boyata, Ambrose, Tierney, Commons, Brown, Bitton, Forrest, Johansen, Griffiths. Subs: Bailly, Blackett, Ciftci, Armstrong, Mackay-Steven, Rogic, Janko. Fenerbahce: Fabiano, Ozbayrakli, Kjaer, Bruno Alves, Kaldirim, Sen, Tufan, Topal, Meireles, Nani, van Persie. Subs: Demirel, Fernandao, Diego, Zeybek, Potuk, Ba, Erkin. Goalscorer Erik Lamela gets a rest as Clinton Njie gets 25 minutes up front. Can he lift the closing stages? The second half has been a non event. Why would you not want Celtic and Rangers in the PL (unless you are relegation candidates)? The greatest atmosphere, the friendliest fans, world class stadium (I'm speaking as a Celtic fan here ), Rangers just for the old firm. Danny Rose - by the way - is back on with a bandaged left hand. And he gets away with a handball shout against his right hand now. Monaco make a change as Stephan El Shaarawy comes on in place of Thomas Lemar. El Shaarawy was the great hope at AC Milan for a few years but has gone rather off the boil. Much like this game. Come on! Celtic in the Premier League? It is a debate that has raged on and off for as long as I can recall - but Celtic still harbour ambitions of playing in a future British League, according to manager Ronny Deila. The subject was raised once again when majority shareholder Dermot Desmond predicted such an outcome for Celtic and Glasgow rivals Rangers. "It takes time but Celtic is a team that should have the opportunity to play in the best league," said Deila. "Hopefully in the end we can get into the Premiership or a league that is more a British thing." That looks painful. Danny Rose is trodden on - accidentally I think - and his hand is bleeding pretty heavily. The fourth official then intervenes to try and prevent the physio from treating him and boss Mauricio Pochettino gets uncharacteristically angry on the sidelines. It's all sorted out in the end. Rose having more treatment. Teenage midfielder Jordan Rossiter is back in the Liverpool side after playing against Bordeaux in the first round. There are seven changes from the Reds' 3-2 win over Aston Villa. Daniel Strurridge is rested but Danny Ings starts and is supported by Belgian striker Divock Origi. Sion are mid-table in the Swiss Super League and feature former Tottenham defender Reto Ziegler and ex-Fulham full-back Elsad Zverotic. The Turkish side are in Glasgow tonight. Remember me?Image caption: Remember me? In a group containing Tottenham, Monaco and Anderlecht, who gave FK Qarabag any hope of qualifying? Well, the Azerbaijani side are second in Group J as it stands after taking the lead against Anderlecht. Elsewhere in Europe, former Wigan striker Franco Di Santo has scored a first-half hat-trick to put Schalke 3-0 up against Asteras Tripolis. Another ex-Premier League player has also been on target, Bryan Ruiz giving Portuguese side Sporting a 1-0 lead at Besiktas. I don’t think the Tottenham coaching staff will be too happy with the amount of chances Monaco have created, but overall I think they'll be pleased to go in 1-0 ahead. Charlie Meach: Top keeper, organised defence and exciting, young talent going forward. Why write off an in-form Spurs side for league success? And indeed Liverpool have made seven changes from the side which beat Aston Villa at the weekend. The four men to keep their place are Simon Mignolet, Nathaniel Clyne, Emre Can and Danny Ings. Liverpool opted to give starts to a number of young players in the 1-1 draw at French side Bordeaux last time out and will do so again. The Reds travel to Everton for the first Merseyside derby of the season on Sunday. "Our approach to this game is how it's been in the competition - this is an opportunity for young players and an opportunity for players on the fringe of the team that aren't getting so many games," said Brendan Rodgers. "But it's also going to require players that have been playing. Ultimately for us the aim is to win the game. "We recognise that our home games in this competition are very important and we enter into it with that mindset. Then we can concentrate on the game on Sunday." Spurs living dangerously in the last few minutes of the first half but they lead at the break courtesy of Erik Lamela's third goal in four games. Tottenham's midfield have been excellent in the last 10 minutes but they have to be careful. One pass from Jeremy Toulalan leaves the middle of the pitch totally empty of blue shirts. Monaco are able to move it out to Thomas Lemar on the left, his low cross hits Toby Alderweireld and flies a yard wide of the far corner. Very close to OG time. And more lovely stuff! This game has come alive. Dele Alli is in behind again, again it's a nice trick to drag the ball back inside, totally beating his man and then he has the cool head to lay it off to Harry Kane. He's 18 yards out, can he finish? No. A bit tame and it's easily blocked. Monaco again break and striker Lacina Traore heads over. Chances galore now. Good move on the left ends with Adama Traore shooting just wide, before Fabio Coentrao heads the loose ball wide. Tottenham attacked at pace, they had numbers over and it was a fantastic example of counter-attacking. They should be able to over-power Monaco now. What a great break! The game has been very sedate but that's a bit of real quality. Erik Lamela starts the break with a lovely pass down the right wing, Nacer Chadli then beats two defenders with a nutmeg before finding Dele Alli breaking into the box. Great composure from the new England call-up to cut inside and shoot, and while Danijel Subasic makes the save, Lamela follows in to slam home. Monaco threaten after good work down their left. they win a free-kick which Kieran Trippier defends manfully, before Nacer Chadli weighs in with a good clearance from the follow-up corner. Good hit! Hugo Lloris is tested for the first time as Monaco midfielder Adama Traore lazers in a strike from 25 yards, it bounces just in front of Lloris but he does well to smother it. Spurs seeing nearly all of the ball now - get the first goal and it has the makings of a comfortable night. It will have been a long time since any of the players played in an atmosphere like this though. Nacer Chadli has to hit the target there, it was brilliant play from Harry Kane. First chance of the night! Danny Rose runs from left-back, he is shown inside and plays a perfect through-ball to find Harry Kane running in on goal. Kane again doesn't look fully sharp as he lets the ball run on past him, it forces him wide but he still gets there ahead of the Monaco keeper. Kane looks up and lays it back to Nacer Chadli, and he chips a shot onto the roof of the net with two defenders scrabbling back to the goalline. Spurs put together a nice passage of play but Danny Rose's cross from the left is poor and easily cut out by Monaco keeper Danijel Subasic. The away fans are in good voice though. In a more competitive, better-attended sporting event Wales are closing in on a win in the Rugby World Cup. You can follow the last 15 minutes or so of that one in this page here. The biggest question from the opening 10 minutes is: Just how long did it take Anthony Martial to say 'yes' to a move to Manchester United from Monaco? It needs to be absolutely rocking here for the atmosphere to reach the players. It feels a little bit soulless. You can listen to BBC London commentary of this match by using the 'live coverage' tab at the top of this page. Thomas Lemar starts a bright Monaco attack with a raking crossfield pass but lanky striker Lacina Traore loses his technique to slash a left-footed shot way over the bar. Low key start. Kieran Trippier pushes on down the right for Spurs and wins a corner with a dangerous low cross but it's well defended by the hosts. PtheP: Chucking it down with rain and £10+ for a beer? Not sure Monaco's a dream destination! What an odd atmosphere. Sounds like a mid-afternoon reserve game, if you've ever been to one of those. I guess in some ways it is. Anyway the hosts have an early sight of goal as Andrea Raggi heads a corner wide. Under way in Monte Carlo. How long before the TV commentator mentions the fact that the pitch is built on top of a car park? Here they come then - Monaco have ex-Everton beanpole Lacina Traore up front, while midfielder Bernardo Silva looked good for Portugal in the U21s in the summer. They could be the danger men - while ex-Real Madrid team-mates Ricardo Carvalho and Fabio Coentrao add some nous at the back. Monaco: Subasic, Fabinho, Raggi, Carvalho, Fabio Coentrao, Joao Moutinho, Toulalan, Adama Traore, Lemar, Bernardo Silva, Lacina Traore. Subs: Nardi, Dirar, Carrillo, Wallace Santos, Bakayoko, Pasalic, El Shaarawy. Tottenham Hotspur: Lloris, Trippier, Alderweireld, Vertonghen, Rose, Alli, Dier, Chadli, Eriksen, Lamela, Kane. Subs: Vorm, N'Jie, Townsend, Fazio, Wimmer, Carroll, Winks. The weather in Monte Carlo looks OK to me - I'm sure the players will cope. Not a huge crowd in so far - always an odd place to play football. Spurs boss Mauricio Pochettino: "We arrive in a very good moment. We will try to win, the Europa League is a very important competition for us. "Monaco have very good players, we expect a tough game tonight. They have a mix of experience and young players with good quality. "We congratulate Dele Alli for being in the England squad. He impressed a lot from the beginning of the season, he deserves it. We need to look after him but he is very mature and has a good personality. "The weather is like in England!" Who needs Australia when you've got Blackpool eh? Where is the best place you've seen your team play? Melbourne watching Liverpool, 90,000 Liverpool fans singing you'll never walk alone . Doesn't get much better than that. Definitely following Reading up to Blackpool on a Bank Holiday weekend. Was a two-day party with a game in the middle! Approximately 6ft 5, late 40s. Excellent beard. Magnetic charisma. Flawless English. If media reports are to be believed then former Borussia Dortmund boss Jurgen Klopp is on his way to England for talks with any number of Premier League sides. Depending on which German tabloid you read, Klopp is wanted by Liverpool, Arsenal, Chelsea and/or Manchester United. Not a bad set of jobs to consider. Of course, none of those clubs are currently in the market for a manager, Klopp may not fancy them anyway. But when's that ever stopped a story eh? I hope you all enjoyed the picture of Glenn Hoddle in our opening entry - some tremendous hair. Asked about Monaco's Stade Louis II, he told BT Sport: "It was state-of-the-art when I played here. In 1987..."
These will be flying off the shelves. Who wouldn't want a half Schalke, half Asteras Tripolis scarf? A Sunday League footballer who deliberately stamped on an opponent's leg, breaking it in several places, has been jailed for a year. Nathaniel Kerr, 24, pleaded guilty at Manchester Crown Court to assault. The 30-year-old victim, Stuart Parsons, had been arguing with one of Kerr's team-mates just before the incident in Stockport last August, the court heard. Mr Parsons had reconstructive surgery on his right ankle and spent weeks in hospital after the assault. A self-employed window cleaner, Parsons has been out of work since the challenge. Spurs put in a superb attacking display at times during the 4-1 win over Manchester City last weekend. Can they repeat the story tonight? Re Diamond Nights (1700hrs) 1 hard working one? Surely 2 - but I'll leave you to decide which 2! The Europa League may have its detractors, and it may lack the pull of the Champions League. "Where is the best place you've ever been to see your team play? And why?" Irrespective of the result - just the best place you've visited please as a consequence of football. Seen a better sky than this at a match?Image caption: Seen a better sky than this at a match? Text us on 81111 (UK only), or tweet us at #bbcfootball. Got pictures? Even better. These two sides have never met in a competitive match before - though Monaco's record in 12 games against English teams is W6 D3 L3. And just last season - as Spurs fans will surely know - they knocked Arsenal out of the Champions League. Monaco have former Chelsea defender Ricardo Carvalho guarding the back, while midfielders Jeremy Toulalan and Joao Moutinho patrol the midfield. Tottenham have named a strong side for the trip to Monaco, and make just three changes to the side that beat Manchester City at the weekend. Right-back Kieran Trippier, left-back Danny Rose and midfielder Nacer Chadli come in for Kyle Walker, Ben Davies and Son Heung-min. On Tuesday Arsenal and Chelsea were handed defeats, while last night Manchester United and City restored a bit of pride with wins against two Bundesliga sides. Can the Premier League boys keep momentum going in the Europa League? Or will they field a bunch of kids and turn in disappointing displays?